Richmond Rasikas is proud to announce a Carnatic vocal concert by Dr. Mangalampalli Balamuralikrishna, as part of their 2013 Spring Concert Series. Legendary Carnatic musician Dr. Mangalampalli Balamuralikrishna was born on July 6, 1930. He had his initial tutelage under Sri Parupalli Ramakrishnayya Pantulu who was a direct descendant of the sishya parampara of Saint Thygaraja. The multi-faceted, Padma Vibhushan awardee is at ease composing, writing, singing and directing music. He has discovered many new ragas such as Mahati, Sumukham, Sarvasri, Prati Madhyamavati, Ganapati and Siddhi. A prolific composer, he has composed several varnams, kritis, tillanas, and jaavalis and in all the 72 melakarta ragas. 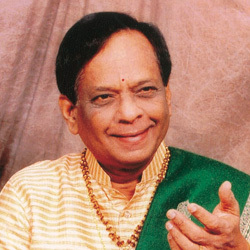 Dr. Balamuralikrishna is also an expert at playing the violin, viola, veena, mridangam and kanjeera. He is also one of the youngest recipients of the Sangeetha Kalanidhi title and is the only musician who has won National Awards for classical music, music direction as well as film playback singing.